Coastal floods are increasing and have destroyed infrastructure and productive land. Salt water intrusion pollutes drinking water, reduces aquaculture profits and affects agriculture. Over the last decade income has decreased for shrimp farmers and fishermen respectively. This decline in well-being, security and self-reliance has been further exacerbated by the collapse of natural resources – timber, fuel, fish – which used to account for more than 50% of their income. Coastal managers typically use “hard” engineered solutions to combat erosion problems and related hazards which do provide important protection but are too expensive and complicated to design along muddy coasts. They do not address the root causes and fail to restore environmental conditions that are crucial for a productive aquaculture and fisheries sector. 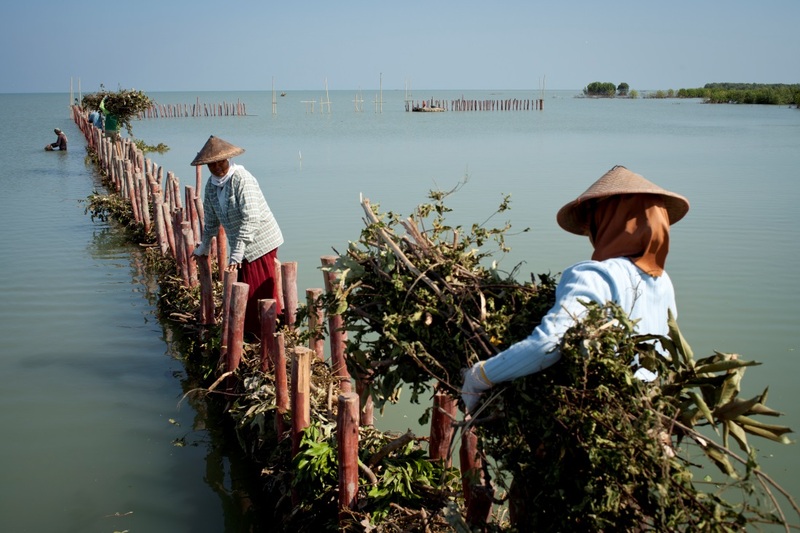 Large scale mangrove planting efforts have failed, hampered by erosion and wave action. Protection measures are implemented ad hoc without coherent strategy. People in Demak District and when the approach can be scaled up to the entire coastline of Central Java, it can help 30million people that will in the long term suffer from coastal flooding and erosion hazards in Northern Java (3000 villages). The construction of permeable dam structures as sediment traps as building block 1 is a precondition for mangrove rehabilitation and coastal zone stabilization. Socio-economic measures to promote sustainable land use options (building block 2) provides local communities with short- and medium-term revenues to compensate previous losses and is a key element to ensure the long-term efforts under building block 1. Capacity building measures (building block 3) provide involved stakeholders with the relevant technical know-how to engage in this initiative while the policy dialogue between different governance levels (building block 4) is essential to integrate this solution in the long-term policy and planning frameworks of the district and province. Coastal security, safety, economic growth and self-reliance of 70.000 vulnerable farmers and fishermen in Demak is enhanced by avoiding further coastal flooding and erosion and providing them with a long term perspective for sustainable economic development. The combination of permeable dams and mangroves protect the villages against storm events. The convincing results of Building with Nature are used to create safer deltas in developing countries, contributing to sustainable inclusive economic growth and poverty reduction and more self-reliance. Extensive stakeholder dialogue and capacity building allow the integration of measures in community development plans and integral government master planning and governed under community bylaws and funding mechanisms This flagship project is used to inform and inspire coastal zone managers from government and private sector and help them include the approach in their urban and rural development programmes. A replication and up-scaling of Building with Nature across Indonesia could indirectly result in increased resilience of 30 million people in Java who are on the long term at risk from coastal hazards, in both urban and rural areas. 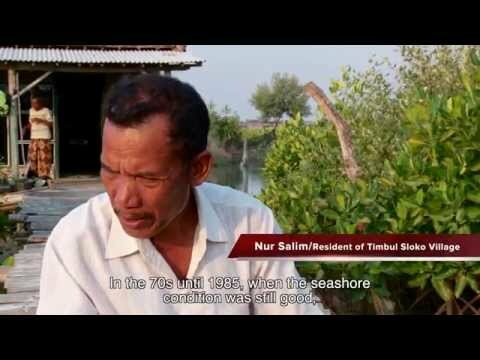 The people in Demak district, 70.000 farmers and fishermen, along the North coast of Java are desperate: in just 10 years’ time their valuable lands have washed away by the sea. They lost their roads and schools. Entire villages disappeared into the water, as the sea encroached up to 3 kilometers inland, claiming over 1000 ha already. Northern Java’s deltaic shorelines suffer from severe erosion and related flooding hazards, caused by mangrove conversion for aquaculture, groundwater extraction and infrastructure development. In some places kilometers of land are already lost. As a result, over 30 million people in Java are at risk. The agri- and aquaculture sectors have suffered multi-billion losses. Conventional hard-infrastructure solutions are ineffective, expensive and unable to adapt to climate change. They fail to bring back economic, environmental and social benefits that healthy mangrove coastlines offer. Timbul Sloko is the pilot site of Building with Nature Indonesia. There seemed to be no means of stopping the erosion and the floods. Major investments were made in seawalls and wave barriers, but all these efforts failed. Mangrove replanting was also not successful as the conditions were not right, such as the input of sufficient sediment. The floods kept on creeping further into the village and taking the land by 100 meters every year. People became desperate and made plans to move away, having witnessed neighbouring villages already being swallowed by the sea. But then a new solution was introduced in the village, called “Building with Nature”. This solution entails the placement of permeable dams (see picture). The permeable dams break the waves and trap sediment thus reclaiming land. Once the land is back, mangroves can recolonize the area and help protect the coastline against erosion. The large scale building with Nature project provides coastal security and supports sustainable revitalization of 6000ha of aquaculture ponds along a 20 km shoreline Now the waves are clearly much lower inside the grid of permeable dams than outside. In some cases, pioneering mangrove trees are already testing the ground. A major breakthrough came when the village signed a decree, demarcating 100 ha of the currently lost land as protected area. This means that once the mangrove belt is restored, it will not suffer the same fate again. The potential and hope is created for a new landscape in which mangroves and aquaculture can be combined sustainably. Mangrove restoration: to plant or not to plant? This solution is published in the Ecosystem-based Adaptation and Marine and coastal portal.